I love cold weather. Writing this post from Texas, I should probably amend that statement to read, “I love cooler weather,” since it seldom gets cold here. A cooler day allows a clothing choice beyond shorts and flip-flops which are ubiquitous for most of the year. For the second day of L’s welcome back, it was cool enough in the early morning to wear my leather jacket. Leather jacket weather, as I like to call it, is my favorite climate, which in London extended into June. 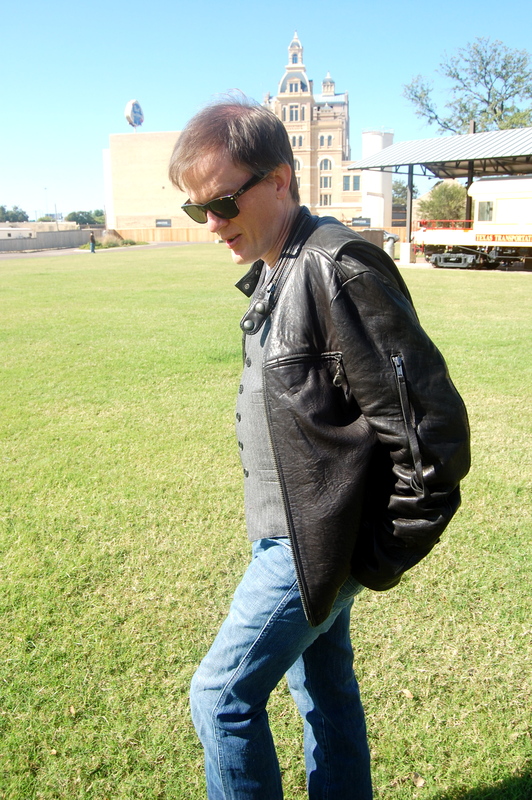 Here, leather jacket weather runs in an inconsistent pattern from the beginning of November through March, so any day I have the opportunity to wear it, I do. Today, however, the highlight of my outfit is the vest I have layered under the jacket. I have been a fan of the vest and leather jacket combo since high school and I hope these pictures will show why. A good leather jacket is an essential part of any wardrobe. It is not only functional — especially if you are on a motorcycle — but stylish. Walk through the Belstaff store, or flip through their collection online and it might be easy to forget their origins lay in utility, not fashion. Pair a leather jacket with a piece like this vest from Operations and you too can pretend you are living a life of postmodern Bully Adventure, or at least hook your thumbs in its pockets and bombast like P.T. Barnum. In all seriousness, there is some sadness here. Operations is a label I stumbled upon too late. It’s existence is in legal limbo, and it ran out on its leases in its New York stores (leaving clothing from the collection in the abandoned stores) back in the spring. We found the pieces that are now happily living in the closet on a heavily discounted clearance rack. I love the design concept of utility punctuated with fine detailing. All of the pieces will eventually make their way here, and you will grow tired of my rhapsodizing. If you know anything about this label beyond my scant knowledge, or of any second-hand markets where any remnants of the collection might be had, please let us know! 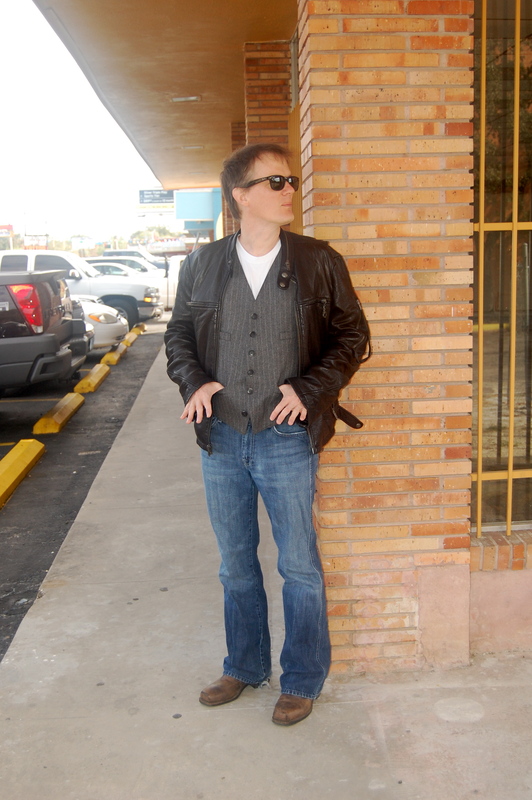 This entry was posted in His, Outfits, San Antonio and tagged 7 for all mankind, calvin klein, frye, juicy couture, oblate cafe, operations, pearl brewery, ray-ban. Bookmark the permalink.